At long last, a beautiful spring weekend! It was surely time to work in the garden. Yesterday, we managed to add another coat of paint to the hives and build a small raised bed for veggies. Today my main goal was finding a new spot to hang the mason bee house and to put my cocoons out. That turned out to make for an exciting afternoon! This is my fourth spring with a mason bee house. The first spring was spectacular. I ordered cocoons, which arrived just after Christmas. I carefully stored them in the crisper inside the refrigerator. When the cherry trees began to bloom, I put the bees out. That summer, bees filled 11 tubes in my bee house. They were happy little things, returning with fresh daubs of mud time and time again. The pear tree in our backyard was sagging with fruit by summer’s end. I left the tubes outside the following winter figuring that the bees are native to this area, so they must be equipped to handle winter. We had a hard winter too. But they chewed their way out of the mud in the spring and the cycle began again. Except that this time, we got an infestation of earwigs. I have searched high and low for information on earwigs and mason bees, and found nothing. But I can tell you from my own experience that the earwigs nested in the empty tubes and ate their way through the larvae. I discovered them destroying my precious larvae in the fall. In horror, I shook the earwigs out of the nesting tubes. But it was too late for the larvae. Either that or my shaking killed them. No one hatched last year. And no wild bees nested. I have heard from other mason bee tenders that last year was a rough one for their bees as well. It was so damp for so long and it never did get solidly above 50 degrees until September. Not good news for bees. So, this year, it was back to purchasing cocoons. They arrived just after Christmas again and have been sitting alongside the carrots and beets in the crisper. Two weeks ago, I received an email from Crown Bees, suppliers of my mason bees, reminding me that it was time to put the cocoons out. Ironically, it was snowing that day. I ignored their advice and decided to wait until the weather got a little bit closer to “steady 55 degrees outside” like the cocoon package said. Today was the third day of sunny weather, so I picked a new spot to mount the bee house and then emptied the cocoons into it. 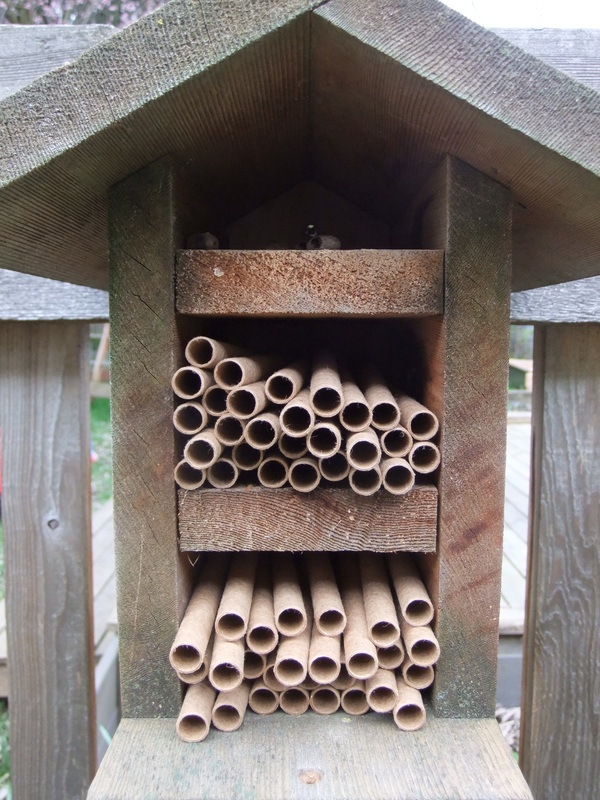 I arranged the new cardboard tubes in a carefully irregular pattern, as Crown Bees recommends giving the bee landmarks so they can find their way back to the nest. I imagined them thinking “mine’s the tube just to the left of that one that sticks out” or some such thing. If I thought they did a waggle dance, I would have imagined that instead. 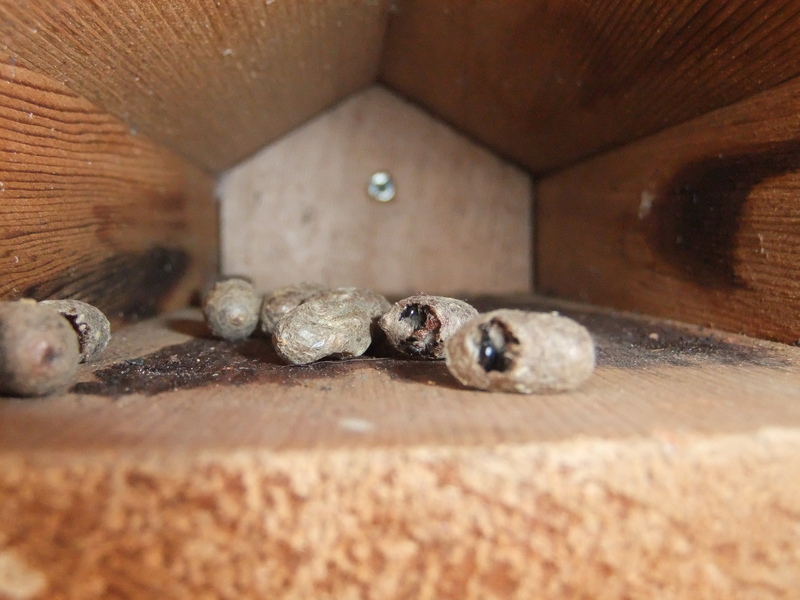 Two cocoons show holes where the bees are getting ready to emerge. Thirty minutes later, I returned outside thinking that perhaps I should hide the cocoons farther back in the house. To my surprise, one bee had hatched already and two more were on their way out! After grabbing the camera, I stood there and watched the second bee chew his way out of the cocoon and the third bee work on getting his head out. Bee two immediately climbed up onto the roof of the bee house to enjoy the sun and stretch his legs. Bee one periodically peeked at me from the inside of a cardboard tube. I couldn’t believe that in 30 minutes they had warmed up enough to hatch! The plum tree is in full bloom, the cherries are just starting and the pear tree is budded out, so I predict some good feasting on our block this week. Go bees!